"These decadent paleo carrot cake cookies taste like carrot cake and take just minutes to make! 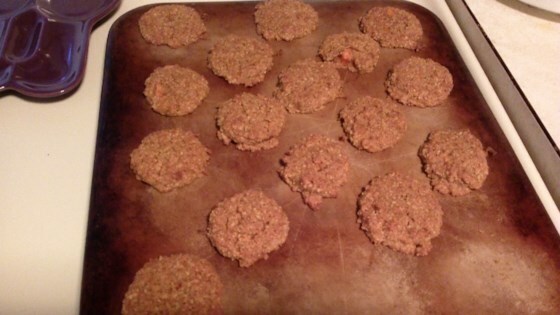 Made with almond flour, carrots, coconut, and cinnamon and no refined oil or sugar, these cookies are grain free, gluten free, paleo, and vegan with a low-calorie option too. Top with Reddi-wip® or coconut whip for a tasty and healthy treat! Store in the refrigerator so that the cookies maintain their structure." Preheat oven to 350 degrees F (175 degrees C). Grease a baking sheet with cooking spray. Mix maple syrup, cinnamon, almond extract, baking soda, and salt together in a bowl with an electric mixer. Add almond flour 1/2 cup at a time, mixing until combined. Mix in coconut oil 1 tablespoon at a time. Fold carrots and coconut into the batter with a spatula. Drop 12 portions of the batter onto the baking sheet using an ice cream scoop. Flatten gently with the palm of your hand. Bake in the preheated oven until golden, about 12 minutes. Cool on the baking sheet, about 10 minutes. Transfer to a cooling rack.